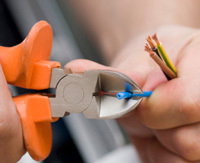 Lynx Electrical and Security provide a professional quality assured electrical installation service covering all aspects of domestic electrical works. We provide you with our experience, expertise and a commitment to a person-to-person service that few will match. Our domestic work load has significantly increased of the past few years and is where we have been able to establish many long lasting relationships with our customers. This has been achieved proudly on a word of mouth basis with little or no advertising. The majority of our domestic work is carried out direct for the home owner however we also work with local Estate Managing Agents and Housing Authorities.